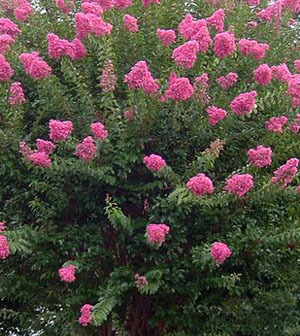 Crape Myrtle (Lagerstroemia indica) comes from China, Japan and Korea, and is a garden favorite in all warm climates from zone 7 on up. The name comes from the profusion of crepe paper like blooms in shades of red, pink, lavender and white. This plant is too often overly pruned to keep it as a shrub, when it should be left to grow to its potential height of 30 to 40 feet. Last year's seed pods should be trimmed off, along with root suckers, but nothing more. In time, the bark peels, revealing its beautiful mottled appearance in various shades or browns, grays and greens. It does best in full sun to assure the most blooms in late spring through summer. Propagation is by stem cuttings or air layering. It is not salt tolerant. Pests include mushroom root rot, mildew and aphids.